Table of the Comparative Heights of the Principal Mountains etc. in the World. 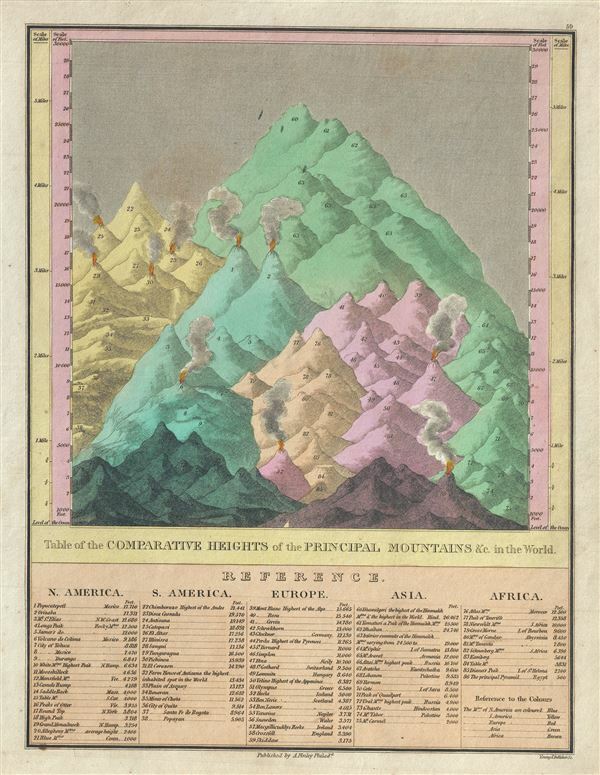 This is Finley's highly sought after c. 1827 map of the comparative heights of the principal mountains of the world. It details the world's great mountains in relative proximity to one another and divided by continent. Each mountain is numbered and refers to a reference list below the chart proper, which names each mountain and its elevation. Also notes important cities, mines, volcanoes and geographical locations, including the Great Pyramid. When this chart was map the highest mountain North America was considered to be Mexico's Popocatepetl, in South America it was Chimborazo, in Europe Mont Blanc, in Asia Dhawalgeri, and in Africa the Atlas Mountains of Morocco. Predates the discovery of Mt. Everest, Mt. Kilimanjaro, Mt. Kenya, and Mt. McKinley (Denali). Engraved by Young and Delleker for the 1827 edition of Anthony Finley's General Atlas. Very good. Original platemark visible. Blank on verso. Minor overall toning. Minor spotting. Rumsey 0285.062 (1831 edition). Phillips (Atlases) 4314, 760, 752, 6045.